Last week, a photographer named Barry Rosen sued Leaf Trading, "Brain" Gray and others for allegedly infringing his registered copyrights on two photographs of Daisy Fuentes and another of Ali Landry. 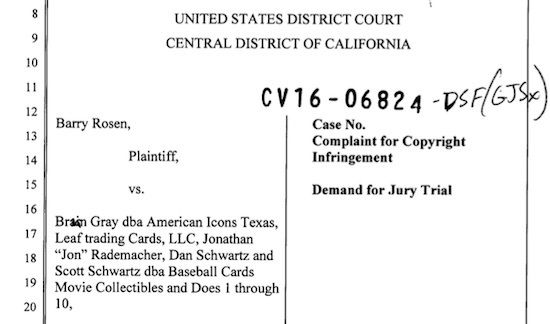 The alleged infringements occurred between 2013 and 2014…and I'd like to be able to tell you what the allegedly infringing items are, or what the original photographs look like, BUT, it appears Mr. Rosen did not attach pictures of them to the complaint. Legal aside: Mr. Rosen does state in Paragraph 7 that his evidence is attached as Exhibit A…but, Exhibit A apparently did not make it on to the PACER database. It's also vague from the complaint as to what the alleged infringing items are. It appears the alleged Fuentes infringements might be based on the sales of two individual items (as compared to two product lines). The Ali Landry accusations, however, look to focus on an art card allegedly based on one of Mr. Rosen's photographs. Without more information (like photos to compare with the alleged infringing items), it's difficult for me to weigh in more on the merits of the suit. There are two general things to note about the suit, though. First, the lawsuit was filed pro se by Mr. Rosen. Legal translation: He filed the suit by himself, he did not use a lawyer. I gnash my teeth at pro se intellectual property filings. Procedurally, there are so many ways to screw up a case, especially a federal case in the Central District of California, and that's before a court would even address the merits. And while pro se filings generally aren't bad, if they contain too many errors or look sloppy, I find that attaches a stigma to the case. Case in point: it doesn't help that Mr. Rosen spelled one of the defendants' names "Brain Gray" instead of "Brian Gray" in the caption. It also doesn't help that instead of correcting that error in WORD and re-printing the first page, someone just scribbled out the "AI" and handwrote…well…something…that might be an "IA." But, what's even worse is that in Paragraph 9 of the complaint, where it names this particular defendant, it still states, "Brain Gray." Besides being sloppy, if you can't get a defendant’s name right, that's a problem for the lawsuit. But, the combination of being a pro se plaintiff, failing to attach "the evidence" of the case, drafting a complaint containing sloppy typos and also being associated with a multitude of other copyright infringement lawsuits (especially when in at least one of those suits he was accused of making mistakes involving…Daisy Fuentes images) might not bode well for Mr. Rosen. Still, because this is a small copyright infringement action, I'd imagine it disappears for a small, confidential payment in less than six months, regardless as to the merits of the case.